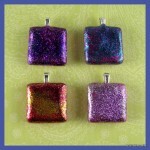 For quite some time I’ve wanted to try to make my own glass tile pendants. The other week I found this great Etsy store, Candy Tiles 2, where there is a nice assortment of materials needed to make glass pendants. Candy Tiles 2 offers these wonderful starter kits, the one I ordered is pictured above. In the kit I received: five Square Glass Tiles, five small Sterling Silver Plated Aanraku Bails, two Diamond Glaze Samples, one tube of Super Glue, six assorted sheets of Chiyogami (Premium Japanese Paper) & Graphic Designed Paper cut to size. Included with the kit are step by step instructions on how to make glass tiles pendants and instructions on how to make Scrabble tile pendants. The instructions were sent to my e-mail addy in PDF format. This starter kit came nicely packaged within the decorated box shown in the photo. As it says in the item description, ordering the starter kit is a nice way to try out making pendants instead investing a lot of money in materials. 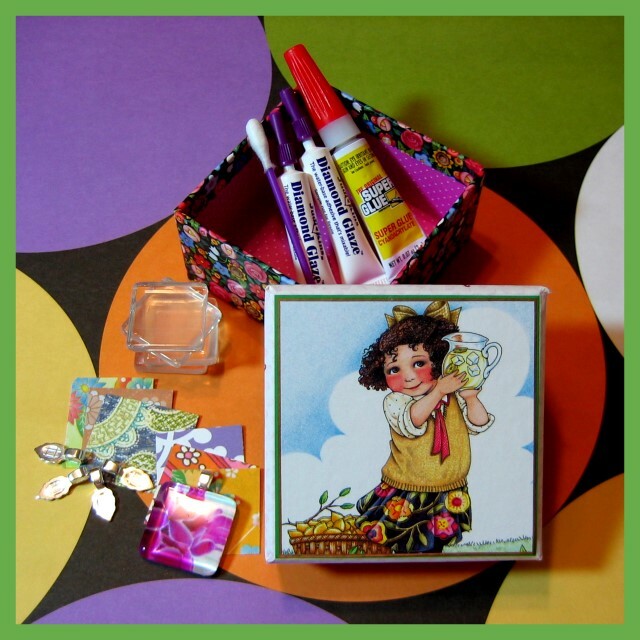 This starter kit is a wonderful way to give it a try and I think they’d make a nice gift for anyone who has a passion for crafting. I didn’t use the paper provided in the kit because I have loads of photos I wanted to use for the pendants. Last night I found a couple handfuls of pics in my photo archives and opened them in Photoshop and cropped each of them down to 7/8″ sqaure. I printed them off on a sheet of 4 x 6 photo paper. 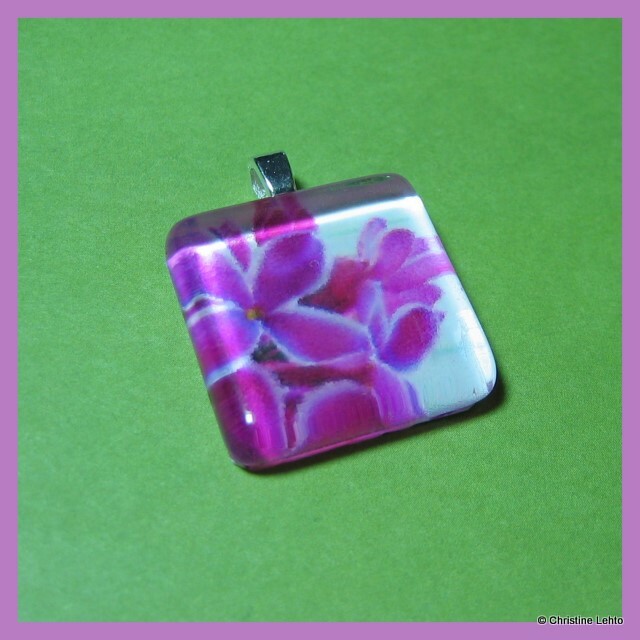 Today I made my first glass tile pendant with a photo of some lilacs. The photo above shows some of my favorite pics from flowers to my kitty Tiggy to my nieces’ new bunnies. I also have a few of my watercolors I’d like to make into pendants. One product I need to order from Candy Tiles 2, is this material called “microglaze” to protect ink jet printed materials. After I made the lilac tile, I tried one of my cat and of the pink water lilly and the images looked a bit blurred. Using the “microglaze” is supposed to prevent smudging, so if you’re going to use ink jet printed images for your pendants, this product sounds like a great thing to have while making your pendants. After I made my first pendant, I was hooked. Stop by the Candy Tiles 2 Etsy store if you want to discover a fun way to make jewelry. 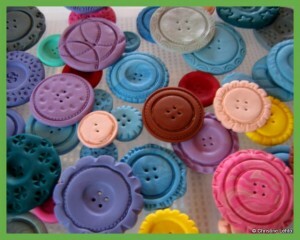 Last week I blogged about my handmade polymer clay buttons and a blogger named Julie left me a comment and a link to let me know that she “gossiped” about my buttons. Today I went to check it out. 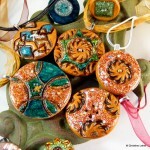 Julie wrote a nice post about my handmade buttons at her Polymer Clay blog. Please stop by Julie’s Polymer Clay gossip blog. 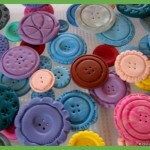 Click here to see my blog post about my buttons. Related Articles. Please click images below to see each article. 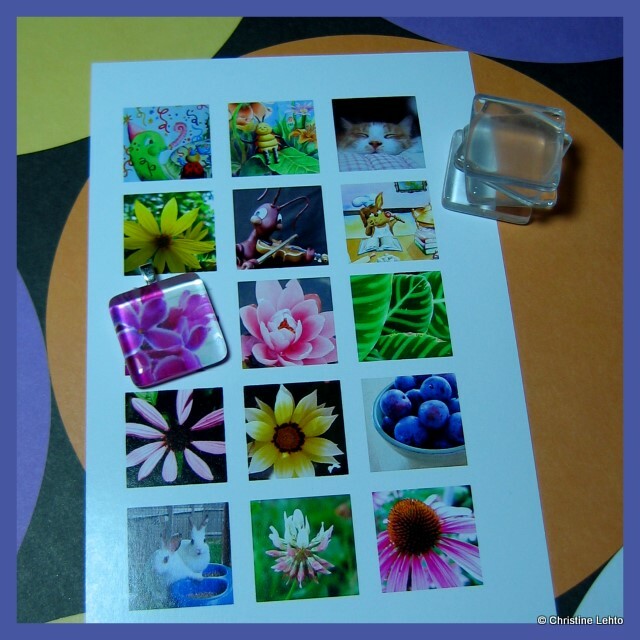 This entry was posted in Photography, Tutorial and tagged christine lehto, craft tutorial, glass tile photo pendants, handmade project, lilly bug boutique, polymer clay buttons. Bookmark the permalink. 9 Responses to Glass tile pendant starter kit! you are so darn crafty!!!!!! Thank you, Renee! 🙂 I loooove crafts! Cool story you got here. I'd like to read something more concerning that topic. Thanks for posting this information. Merely wanna remark that you have a very decent website , I the style and design it actually stands out. Are you related to Lillyds.com? I have bought all my glass pendant supplies from her. I was just wondering? Lisa, no I am not related to Lillyds.com. I bought the glass tiles from an Etsy store.